The elves are getting ready for Christmas in Santa’s workshop, and all is well until Santa entrusts Bumbles with the all-important jar of Christmas magic. When everything goes awry it appears that Christmas is doomed, but Santa has confidence in Bumbles’ ability to fix his mistake – but can everything be set to rights before Christmas day arrives? 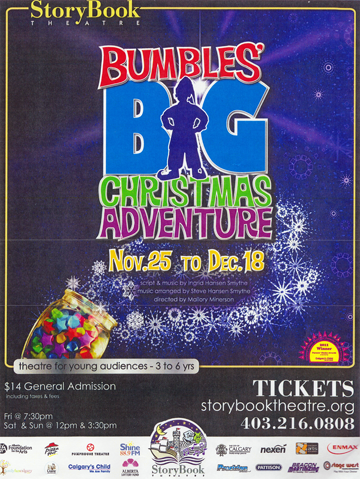 Bumbles’ Big Christmas Adventure was produced by Storybook Theatre from November 25th to December 18th, 2011. Stuffed toys are everywhere in Sophie’s bedroom, but there is one toy in particular, the Velveteen Beaver, whom Sophie loves best of all. The Velveteen Beaver loves Sophie too, even while wanting to be a real beaver, with a real tail instead of a stupid label. But germophobic Aunt Hattie would just as soon throw the Velveteen Beaver out after he’s been around a very sick Sophie. 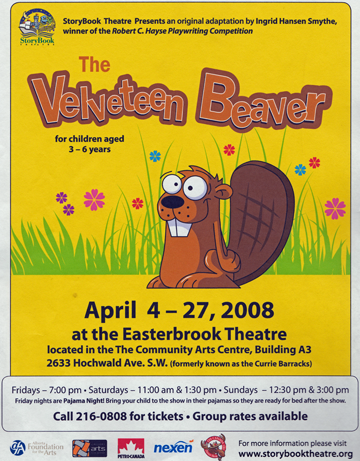 Winner of the 2007 Robert C. Hayes Playwrights Competition, and performed by Storybook Theatre in the spring of 2008.